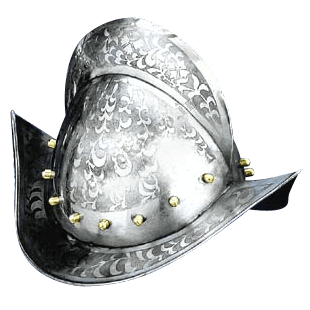 The morion helmet was originally introduced in the 16th and early 17th centuries. It was a popular and effective design, so much so that even officers favored it, although theirs were more like this Engraved Comb Morion Helm, to display personal status. The morion helmet was most often associated with the Spanish, as their famed conquistadors favored this helmet along with a breastplate as their ideal uniform for battling and exploring. This helmet consists of a round base and crown with sloping sides. Along these sides are flared edges that are designed to help shield and divert attacks away from the wearers face. Across the top of the helmet is a tall crest, which here, on this helmet, serves as much as decoration as it does for the purpose of improved helm strength and defense. The most impressive feature of this helmet, though, is that its ornately engraved, making it a symbol of status, wealth, and prestige, as much as a piece of personal protection. Decorative vine and leaf patterns trace their way across the surface of the helm. 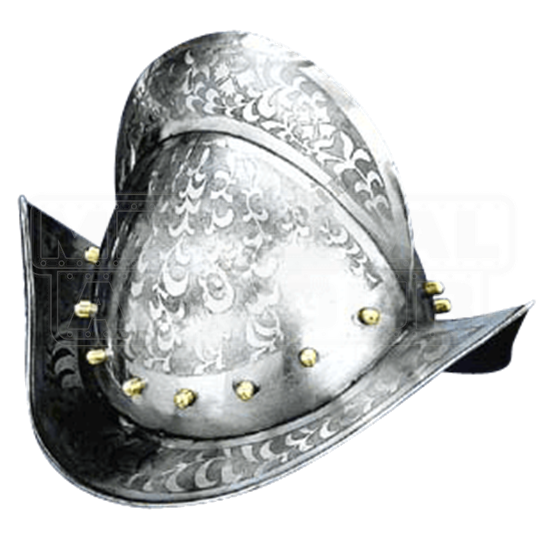 The helmet is made entirely from quality steel, making it perfect to wear as a helmet for your medieval or conquistador costume. And even if you do not plan on wearing it, this Engraved Comb Morion Helm is a true piece of history that has a look worthy of display, making it a great piece to include in your collection or decor, as well.